The Blackhawk was designed for a wide range of jobs with maximum efficiency for handling petroleum based products. The Blackhawk is capable of dispersing disinfectants, deodorizers, germicides and insecticides for application in greenhouses, a wide range of warehouses, and for outdoor pest control in parks, gardens, and golf courses. 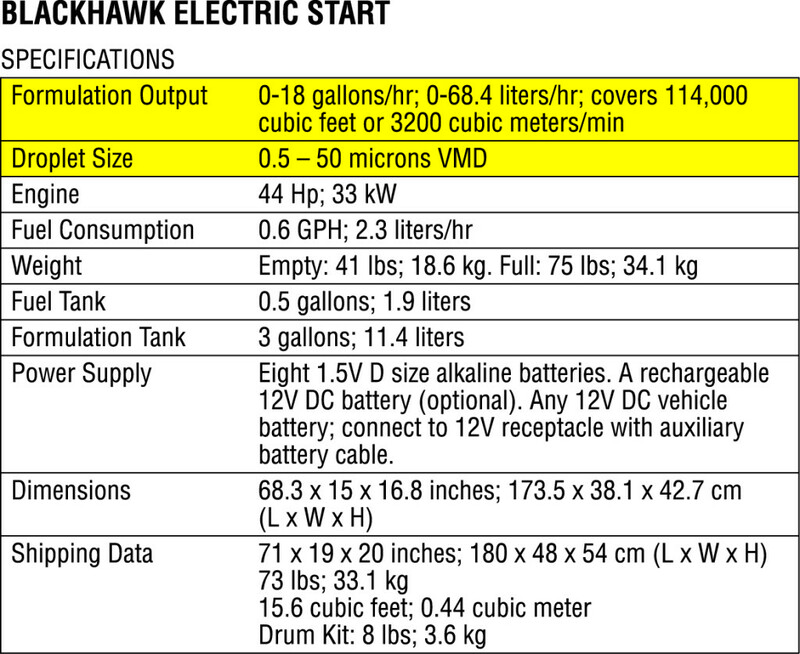 Blackhawk’s simple, innovative design reduces unit maintenance and will provide years of rugged, reliable performance. Up to 18 gallons per hour capacity, rugged construction, easy maintenance and our patented electric starting system assures greater reliability, effectiveness, fuel efficiency and ease of operation. The machine is also equipped with an easy to clean stainless steel formulation filter that keeps the system free of unwanted dirt and residue.